The Wedeco Spektron series is a proven, energy-efficient UV solution for the disinfection of drinking water, process water, and other high UV transmittance liquids, with more than 2,000 installed systems worldwide. Xylem's Wedeco Spektron UV systems have also been extensively tested to meet the U.S. Environmental Protection Agency’s UV Disinfection Guidance Manual (USEPA’s UVDGM, 2006) and certified to the German DVGW and Austrian ONORM standards. The extensive validation allows for proven disinfection performance for a wide variety of pathogens, including parasites (e.g. Cryptosporidium and Giardia), bacteria (e.g. E. coli, Salmonella typhii, Vibrio cholerae, Pseudomonas aeruginosa) and viruses (e.g. Poliovirus, Norovirus and Rotavirus). More than 99.99% of all pathogens can be rendered harmless in a fraction of a second without affecting the taste or odor of the water. As a purely physical disinfection solution and 100% chemical free, UV does not carry the risk of forming harmful by-products, such as trihalomethanes (THMs) and haloacetic acids (HAAs). In addition the Spektron automatic wiping system works without chemical cleaning additives. UV technology is safer for your employees, your community, and the environment. UV disinfection eliminates the risks associated with on-site storage and handling of hazardous chemicals, keeping your treatment plant and the surrounding community protected from accidental leaks. Additionally, the sensor-controlled OptiDose monitors operating conditions in real time, including flow, UV transmittance, and UV intensity. Then, with proven control logic, OptiDose adjusts the energy consumption to the minimum needed to meet dosing requirements. No assumptions are made regarding process parameters, ensuring cost savings and disinfection confidence at all times. 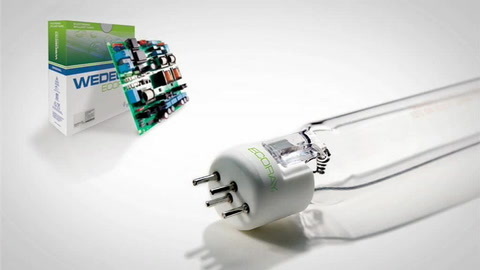 For improved economics and maximum sustainability, Spektron units employ Wedeco low-pressure, high-output, amalgam Ecoray UV lamps and ballasts. Used in combination with the variable power option, the Ecoray technology results in excellent energy efficiency under all operating conditions. Particularly in dimmed mode, they realize average energy savings of up to 20% compared to existing technologies. The Ecoray 600 Watt (W) lamp also has higher energy efficiency compared to medium pressure lamps, further reducing energy costs. Thanks to reduced mercury content, Ecoray lamps are also more stable and sustainable - an environmentally friendly feature of Spektron units that can help reduce the carbon footprint. The Spektron UV systems offer various sizes (14 x CE, 10 x cUL standard), allowing the best design tailored to the customer’s flow range. 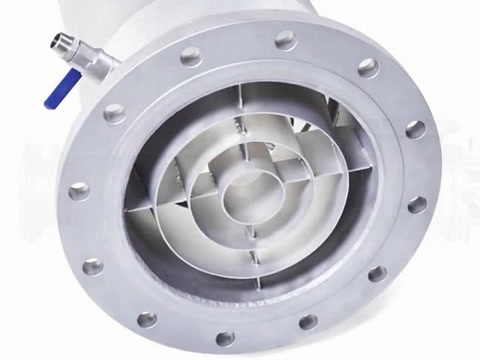 The patented OptiCone flow diverter makes the impact of inlet piping conditions negligible, thereby simplifying installation requirements. In addition, the systems can be installed in various orientations (horizontally, vertically, outlet flange rotation). With various control modes, cabinet types, and SCADA communication types, the Spektron series can easily be customized to match specific site requirements. The Wedeco Spektron UV systems maximize operator usability with minimum maintenance. The EcoTouch controller unifies all sensor signals, alarms, SCADA connectivity, and OptiDose closed loop control for easy monitoring and control. An automatic wiping system keeps the sleeves clean, minimizing manual cleaning effort, and Ecoray UV lamps come with a 14,000 hour lamp life guarantee, reducing lamp maintenance. "OptiDose (true sensor based variable lamp output)"
DN 150 / ANSI 6"